To schedule a seminar or find out more about the program, please e-mail the LDESP Staff (LDESP_Staff@nps.edu). OECD: Is this Humanitarian Migration Crisis Different? What do the words “ethnic group” and “tribe” mean with regard to Afghanistan? Southern Sinai Security and the MFO Mission: Why are militants so hesitant to carry out attacks in the Southern Sinai? Do you have a specific question about the operational environment of a particular country or region? Email us at LDESP_staff@nps.edu and we will reach out to one of our stellar faculty members and lecturers for their expert opinion. LDESP includes faculty who offer multiple perspectives to issues. LDESP includes group and faculty panel discussions. LDESP includes seminars and workshops with militaries and security organizations of partner nations. Established in 2001, the Leader Development and Education for Sustained Peace Program (LDESP) is a DoD organization at the Naval Postgraduate School that prepare senior military and civilian US leaders for short and long-term engagement in Africa, Pacific, Middle East, Europe and other regions around the world and educates law enforcement and civilian leaders from partner nations to counter disinformation, combat violent extremism . The program executes distance learning courses and graduate level education for military and civilian leaders to establish a regional, geopolitical, and cultural framework for understanding the challenges of conducting full spectrum operations in unique and rapidly changing environments. MESSAGE: The secure LDESP site is down. We regret to inform you that the LDESP courses are not accessible at this time. We are attempting to migrate the content to an alternative site. We apologize for the inconvenience. WORKSHOPS ON COMBATING VIOLENT EXTREMISM: Seminars and workshops customized to address the concerns of the Ministry of Interior, law enforcement and security organizations in partner countries focusing on law enforcement challenges in the region, immigration, radicalization trends in the region, de-radicalization strategies and cooperative measures with regional law enforcement networks. These events will include a scenario based exercises, case studies and projects. 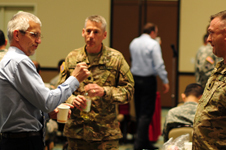 STATE PARTNERSHIP PROGRAMS:State Partnership seminars focusing on areas of cooperation between the state National Guard within the US and its partner country. WORKSHOPS ON DETERRING GRAY ZONE ACTIVITIES & PROPAGANDA OF ADVERSARIAL NATIONS: Seminars and workshops to promote critical thinking, and analyze propaganda and disinformation efforts of adversarial nations and non state actors that pose a threat to the national security interests of the US and partner nations. The participants will arrive at a common and shared understanding of the extent, capacities and capabilities of adversarial actors’ influence in the region of interest, dialogue on different approaches to counter gray zone activities, to include election meddling, regional aggression and cyber attacks, review approaches to counter the disinformation while exploring opportunities for greater information sharing, enhancing cyber defense capabilities, and developing collective strategies to counter disinformation. LEADERSHIP PROGRAMS: Leadership seminars that aim to develop innovative thinkers, capable of predicting second and third order effects, who have the cultural and political understanding necessary to effectively use negotiation skills and who can retain team building and training skills along with the capacity to leverage technology. Please contact the LDESP staff at ldesp_staff@nps.edu to learn more about scheduling a seminar. Welcome to the LDESP Distance Learning Program. Detailed instructions for navigating the LDESP site, enrolling in courses, printing certificates, managing your account and opting out of the News Update distribution list are provided in the LDESP Navigation Guide. Feedback: Please let us know if you have any suggestions to improve the online interface, during this transition period by emailing us at ldesp_staff@nps.edu. Documents are taken from military and established professional sites with public information. The documents linked here are intended to provide readers with a better understanding of various interests and perspectives regarding the situation in diverse regions. Opinions expressed in the articles, commentaries and features do not constitute endorsement by the Department of Defense, the US Navy, or the LDESP staff.